How much light a lamp produces and distributes is generally considered in basic terms simply as light output. Most common light bulbs and lamps carry a simple output rating expressed as lumens, with many industry professionals and consumers simply referring to lumen output as an indicator of lamp brightness. For conventional lighting such as incandescent and fluorescent style bulbs, associating lumens with perceived brightness is generally adequate for most applications. However, new lighting technologies such as LEDs do not fit with established norms of wattages, lumens, and perceived brightness, which can cause a great deal of misunderstanding for those wishing to switch to LED lighting from traditional lighting types. When considering LED output, there are a host of factors which contribute to making it difficult to apply the tried and true lumen as a reliable measure of output or perceived brightness. One of the most significant factors when attempting to apply standard lumens as a measure of LED output is the directional nature of the LED itself versus the 360 degree radiation pattern of traditional light bulbs. Put simply, a normal light bulb, be it an incandescent bulb or fluorescent tube, radiates light in all directions from its surface. As a result, the output of a standard bulb is generally considered a measure of the bubs overall brightness or lumen output. A higher lumen output will generally mean that a traditional bulb will be brighter. With LEDs however, this is not the case. The solid state design of the LED is such that light energy is radiated over a limited portion of its surface. Rather than emitting light in 360 degrees, the degree of light radiation is limited by the shape of the LEDs radiating surface. For example, an LED is basically a flat square chip of semi-conducting material, and light energy only radiates from the upper surface of this square. No light radiates from the back or sides of the LED chip, and so the pattern of light radiation is limited to the single upper surface of the LED. In traditional light bulbs, light radiates over the entire surface of the bulb, thus 360 degrees of light radiation. What this means for measuring the output of LEDs, is that since output is directional as well as concentrated over a smaller area, perceived brightness is no longer relevant to actual lumen output. Imagine if you will a normal light bulb, and then consider if you could take all of the light energy it radiates and confine that output to only one portion of the bulbs surface. If this were possible, all of the output would then be confined to a small area and would appear intensified and thus much brighter, in effect raising the bulbs perceived luminal output. What this means for LEDs is that if we try to apply the normal intuitive approach of lumens=brightness to LEDs, we could easily end up choosing an LED light source that is poorly matched to our needs. In order to effectively determine the useful output of LEDs, we need to instead consider delivered light rather than total lumen output. Delivered light is more formally known as illuminance, which is simply a measure of the total amount of light from a given light source that reaches an area of defined size. In the case of illuminance, measurements are defined in foot candles if the space is measured in square feet, and lux if measured in meters. Basically, the amount of light reaching a surface of determined size is defined as equaling the light produced by a by either a single or multiple number of candles. Thus 5 foot candles at 5 feet would mean the light reaching 5 square feet of area is equal to the of five candles. Measuring LED output in this way is much more effective than simple output in lumens for a number of reasons. First and foremost, with traditional light sources, only a percentage of the actual lumen output reaches the desired areas. Despite the inclusion of reflectors, diffusers and various housing designs, much output is lost to light radiating away from the desired target area as well as being absorbed by reflective surfaces due to the inefficiency of these surfaces. Even though a typical halogen bulb may be designed specifically to direct light in one direction for instance, much output is still lost to diffusion and absorption as the surfaces of the reflectors are less than 100% efficient. 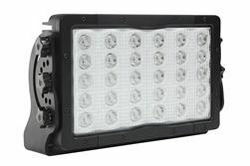 Although the halogen may put out a total of 800 lumens, only about 500 or so lumens actually reaches the area to be illuminated, with the rest reflected or diffused off into non target areas and still more simply absorbed due to diffusion and poor reflectivity. The directional nature of LEDs gives them an advantage over traditional lights sources because more of their output reaches the desired areas with less reflective loss. For example, we could take a traditional fluorescent paint booth fixture producing 2,000 lumens and hang it over a work table at a certain height and effectively produce 25 foot candles at the table surface. We could also take an LED paint booth fixture producing only 1200 lumens and hang it from the same height over the same table, and produce 30 foot candles at the table surface. This is possible because rather than radiate light over 360 degrees, the LED produces all of its output over 110-160 degrees, concentrating output over a smaller area, and negating the need for reflectors and diffusers that further reduce the amount of light reaching the task space. Because of this, it is more effective for those considering LED lighting to instead concentrate on total FIXTURE lumens rather than total bulb lumens. When we consider LEDs versus traditional light sources in this way, we can more effectively determine the proper LED fixture to replace an existing incandescent or fluorescent without losing illuminance at the target area. This is particularly important for commercial and industrial applications where task space lighting is critical to safety and high production efficiency. In addition, it helps us to further appreciate the efficiency of LEDs compared to other light sources and the potential savings in energy costs that follow as a result. If we can more effectively utilize light output by reducing wasted light energy, we are in effect reducing energy costs associated with lighting because we do not need as much total light output. LEDs are rapidly changing the way we light our world, and it will be necessary for consumers to adjust their understanding of how lighting is applied if they are to realize the full benefit of efficient lighting technologies such as LEDs. Although at first glance is may seem confusing or difficult to understand the differences between LEDs and traditional light sources, when we simply consider how much light we actually need, and then consider the ability of LEDs to provide that illuminance at reduced lumen levels, it no longer appears so difficult.